« How to Wear Pajama Pants for a Special Event — Take a Cue from Emma Stone! Gwen Stefani really knows how to rock it like it’s nobody’s business. The 43-year-old singer is probably one of the most “badass” celebrity mothers out there with her no-nonsense attitude when it comes to her old-school punk style. Don’t you think so? Gwen was spotted heading back to her car after dropping Zuma off at his school while wearing an edgy and rocking ensemble that screams out, “Don’t mess with me!” You really have to hand it to her. Even at her age, she can still pull off these kinds of outfits and look much better than many of today’s young hipsters. I don’t know about you, but I’m quite sold on getting my own pair of ripped and shredded boyfriend jeans, thanks to Gwen’s look! How about you? 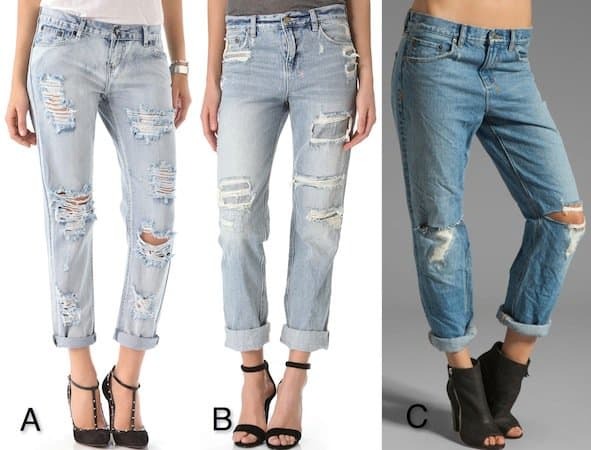 If you would like to try the whole old-school punk look this season, then check out the following super shredded and ripped boyfriend jeans at Shopbop and RevolveClothing. See how else you can style them up to get your own rocking look!